The reelection campaign for Democratic Sen. Claire McCaskill (Mo.) spent nearly $21,000 on private air travel in three months, according to its most recent campaign filing. McCaskill's filing to the Federal Election Committee discloses 11 payments totaling $20,911 made to Aero Charter, a Missouri-based company that both charters planes and offers an aircraft management service for those who own private planes. The company is based at Spirit of St. Louis Airport, a small two-runway facility located near McCaskill's Kirkwood home. Representatives for both the McCaskill campaign and for Aero Charter failed to respond to numerous inquiries into what services were provided. McCaskill covered nearly all the costs for the private air travel through $17,620 worth of in-kind contributions to her campaign that were specified for travel, leaving just under $3,300 that was covered by the campaign, according to the report. McCaskill and her husband own a 2009 Pilatus PC-12/47E single-engine plane through their company, TLG Aviation LLC. On McCaskill's personal financial disclosure form, the company is valued at over $1 million. The plane is registered at the same airport where Aero Charter is headquartered. The campaign finance report also reveals that in the midst of McCaskill's payments to Aero Charter, one of the company's executives, Raymond Van de Riet Jr., kicked $1,000 to McCaskill's campaign. Van de Riet, who in the past has been more likely to contribute to Republicans, did not respond to inquiries into his contribution. Much of McCaskill's use of her private plane appears to have come during her town-hall tour throughout Missouri over the August recess. McCaskill's town halls are handled by her Senate office staff and considered part of her official duties. It is unclear why the cost of travel between town halls appears on the campaign's finance report. McCaskill's decision to cover most of the expenses of her travel on private planes out of her own pocket comes six years after it was revealed she had used $88,000 of Senate funds to pay for travel on her own plane. Prior to her 2012 reelection campaign she cut a check to the Treasury Department to cover the cost and promised to "sell the damn plane." "I have convinced my husband to sell the damn plane," she said. "I will never set foot on the plane again." They did in fact sell the plane, but then went on to buy a new one in 2013 after McCaskill won her reelection fight. 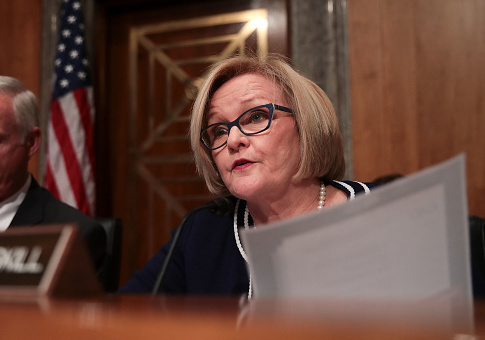 Luxury travel continues to be a headache for McCaskill as she gears up for her latest reelection fight. Already this year she has attracted criticism for paying for two Democratic colleagues and their wives to fly to Mexico for her husband's birthday party and saying during a town hall that "normal people can afford" travel on private planes. Republicans hit the airwaves with an ad centered on footage of her boarding her luxury craft and have taken to calling her "Air Claire." McCaskill reported travel through Aero Charter in June, July, August, and September. This entry was posted in Politics and tagged 2018 Election, Claire McCaskill. Bookmark the permalink.